Oracle Database can authenticate and authorize Microsoft Active Directory users with the database directly without intermediate directories or Oracle Enterprise User Security. Centrally managed users (CMU) provides a simpler integration with Microsoft Active Directory to allow centralized authentication and authorization of users. Before you can use Microsoft Active Directory to authenticate and authorize users, you must configure the connection from the Oracle database to Active Directory. You can configure password authentication, Kerberos authentication, or public key infrastructure (PKI) authentication. With centrally managed users, you can manage the authorization for Active Directory users to access Oracle databases. As part of the Oracle Database-Microsoft Active Directory integration, Oracle Database enforces the Active Directory account policies when Active Directory users log into the Oracle database. Centrally managed users provides a simpler integration with Microsoft Active Directory to allow centralized authentication and authorization of users. The integration works by mapping Microsoft Active Directory users and groups directly to Oracle database users and roles. The CMU with Active Directory architecture enables Oracle Database users and roles to be managed in Active Directory. The Oracle Database-Microsoft Active Directory integration supports three common authentication methods. CMU with Active Directory supports exclusively mapped users, users mapped to shared schemas, and administrative users. Multitenant database users in pluggable databases (PDBs) can connect to a central Microsoft Active Directory or, if required, users in an individual PDB can connect to a different Microsoft Active Directory. The minimum version requirement for Active Directory server operating system is Microsoft Windows Server 2008 R2. This integration enables organizations to use Active Directory to centrally manage users and roles in multiple Oracle databases with a single directory along with other Information Technology services. Active Directory users can authenticate to the Oracle database by using credentials that are stored in Active Directory. Active Directory users can also be associated with database users (schemas) and roles by using Active Directory groups. Microsoft Active Directory users can be mapped to exclusive or shared Oracle Database users (schemas), and be associated with database roles through their group membership in the directory. Active Directory account policies such as password expiration time and lockout after a specified number of failed login attempts are honored by the Oracle Database when users login. Before Oracle Database 18c release 1 (18.1), database user authentication and authorization could be integrated with Active Directory by configuring Oracle Enterprise User Security and installing and configuring Oracle Internet Directory (or Oracle Universal Directory). This architecture is still available and will continue to be used by users who must use the Oracle enterprise domain and current user database link between trusted databases, complex enterprise roles, and having a single place for auditing database access privileges and roles. The majority of organizations do not have these complex requirements. Instead, they can use centrally managed users (CMUs) with Active Directory. This integration is designed for organizations who prefer to use Active Directory as their centralized identity management solution. Oracle Net Naming Services continues to work as it did before with directory services. Organizations can use Kerberos, PKI, or password authentication with CMU with Active Directory. Use of CMU with Active Directory is backward compatible with currently supported Oracle Database clients. This means that LDAP bind operations are not used for password authentication and you will need to add an Oracle filter to Active Directory along with an extension to the Active Directory schema to store password verifiers. Organizations using Kerberos or PKI will not need to add the filter or extend Active Directory schema. Users who currently use Oracle Enterprise User Security, Oracle Internet Directory, Oracle Unified Directory, Oracle Virtual Directory, and need to integrate with Active Directory. In order for the Oracle Database CMU with Active Directory integration to work, the Oracle database must be able to login to a service account specifically created for the database in Active Directory. The database uses this service account to query Active Directory for user and group information when a user logs into the database. This Active Directory service account must have all the privileges required to query the user and group information as well as being able to write updates related to the password policies in Active Directory (for example, failed login attempts, clear failed login attempts). Users can authenticate using passwords, Kerberos, or PKI and either be assigned to an exclusive schema or a shared schema. Mapping of an Active Directory user to a shared schema is determined by the association of the user to an Active Directory group that is mapped to the shared schema. Active Directory groups can also be mapped to database global roles. An Active Directory security administrator can assign a user to groups that are mapped to shared database global users (schemas) and/or database global roles, and hence update privileges and roles that are assigned to the Active Directory user in a database. The following figure illustrates the Oracle Database CMU feature. 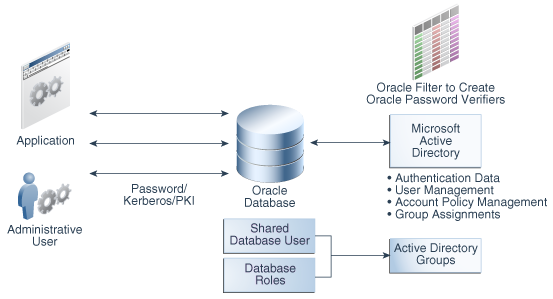 In this figure, users, either through applications as non-administrative users or administrative users, connect to the Oracle database with either password, Kerberos, or public key infrastructure (PKI) authentication. The database connection to Active Directory enables these users and roles to be mapped with Active Directory users and groups. If you plan to use password authentication, then you must install an Oracle filter in Active Directory. You can use an Oracle provided utility to install the Oracle filter that will generate Oracle password verifiers for individual users as needed. The utility can also be used to extend the Active Directory schema to hold the Oracle password verifiers. With Oracle Database centrally managed users, an Active Directory administrator can control the authentication, user management, account policies, and group assignments of Active Directory users and groups who have been mapped to Oracle Database users and roles. Directory users that access an Oracle database using a shared schema. This type of directory user can connect to a shared schema in the database by being part of a directory group that is mapped to the shared schema (database user). Using shared schemas allows centralized Active Directory management of database users and is the recommended best practices over using exclusive schemas (described next). Even if there is only one user associated with a schema (for example, an administrator responsible for database backup), it is easier to manage adding another backup administrator or removing the existing administrator by making changes only in Active Directory instead of making changes in all associated databases as well. Users will be given additional privileges appropriate to their task using global roles that are mapped to groups in Active Directory. With this design, a user can change his or her tasks within an organization and have new database privileges through a new group in Active Directory. If an exclusive mapping exists for a user, then that mapping takes precedence over any other shared mappings. If multiple shared schema mappings exist for a user, then the shared user mapping with lowest schema ID (USER_ID) takes precedence. Oracle recommends only having one possible mapping per user so unexpected schema mappings do not occur. Exclusively mapped global users who are regular Oracle Database users in two- and three-tier applications, or users who have direct privilege grants in the database. Oracle recommends that you grant privileges to these users through global roles. This type of privilege grant facilitates authorization management by centrally managing privileges and roles for a user instead of having to log in into each database to update privileges and roles for the user. Administrative global users, who have the following administrative privileges: SYSDBA, SYSOPER, SYSBACKUP, SYSDG, SYSKM, and SYSRAC. You cannot grant these administrative privileges through global roles. To authorize an Active Directory user with these administrative privileges, you must map the directory user to a database user (exclusively or with a shared schema) that has the system administrative privilege already granted to the database user account. All PDBs and the root container in a multitenant database can have a shared configuration, so that the entire CDB can authenticate and authorize users against a single Active Directory server, mulitple Active Directory servers in one Windows domain, or multiple Active Directory servers in trusted Windows domains, based on the shared configuration. Alternatively, individual PDBs can authenticate and authorize users against different Active Directory servers in the same Windows domain or different (trusted or un-trusted) Windows domains, based on their individual configurations. Before you configure this connection, you must have Microsoft Active Directory installed and configured. You can configure a Microsoft Active Directory connection during the Oracle database creation or with an existing Oracle database. You must create an Oracle service directory user in Active Directory, configure the Oracle Database connection to Active Directory, and then depending on the authentication type, configure the database and Active Directory for password, Kerberos, or public key infrastructure (PKI) authentication. Before you map Database users and global roles to Active Directory users and groups, you must ensure that the Active Directory users and groups have been created. You will map the database users and global roles to Active Directory users and groups by using the CREATE USER, CREATE ROLE, ALTER USER, ALTER ROLE SQL statements with the GLOBALLY clause. An Active Directory system administrator must also set up new Active Directory groups with Active Directory users to meet your requirements. The Oracle service directory user account is for the interaction between Oracle Database and the LDAP directory service. You can use the Oracle opwdintg.exe executable on the Active Directory server to install the password filter and extend the Active Directory schema. If you have not done so yet, then use Oracle Universal Installer (OUI) to install the Oracle software. The dsi.ora file specifies connections for centrally managed users for Active Directory. After you have configured the dsi.ora or ldap.ora file, you are ready to prepare Microsoft Active Directory and Oracle Database certificates for a secure connection. After you have copied the Active Directory certificate, you are ready to add it to the Oracle wallet. Next, you are ready to connect the database to Active Directory using the settings you have so far. The orapki utility can verify that the wallet for this database was created successfully. To test the integration, you must set the ORACLE_HOME, ORACLE_BASE, and ORACLE_SID environment variables and then verify the LDAP parameter settings. In addition to being used for the Oracle Database-to-LDAP directory service interaction, the Oracle service directory user account can be used for Kerberos. This account is an Active Directory account that Oracle Database uses to log in to Active Directory and query for users and group information from Active Directory, update login success or failure, and if Kerberos is configured, update Kerberos authentication. The minimum permissions required for this account are Read properties (of Active Directory users who will log in to a database), and if database password authentication is to be used by Active Directory users, the Write lockoutTime (property of the Active Directory users) permission. Log in to Microsoft Active Directory as a user who has privileges to create accounts and grant them privileges. Create the Oracle service directory user account as an Active Directory user. If all the Active Directory users will be in one domain, then create this account in that domain. Doing so will help performance. The Active directory users will be in different domains. Active Directory has multiple Windows domains, so that CMU can support these multiple domains. Grant the Oracle service directory user account the Read properties (of Active Directory users who will log in a database) and Write lockoutTime (property of Active Directory users who will use password authentication) permissions in the Active Directory. You do not need to perform this step if your authentication method is Kerberos or SSL. The opwdintg.exe executable installs the Oracle password filter, extends the Active Directory schema, and creates Active Directory groups to allow Oracle Database password authentication with Active Directory. This procedure adds an orclCommonAttribute attribute to the Active Directory schema for user accounts. You must install the Oracle password filter on every Windows domain controller in a domain, to ensure that Oracle password verifiers will be generated for Active Directory users in this domain if they need to use password authentication to log in Oracle database. Note also that orclCommonAttribute stores Oracle password verifier for the Active Directory user. This attribute is also used for password authentication by other Oracle products or features such as Enterprise User Security. For security consideration, you should deny everyone except the Oracle service directory user from accessing the orclCommonAttribute attribute. After you install Oracle database server software, then go to the $ORACLE_HOME/bin directory. Find the opwdintg.exe (Oracle Password Integration) utility. Using a secure method of copying (such as sftp), copy opwdintg.exe to a temporary directory (for example, C:\temp) on each Windows domain controller. Connect to the Windows computer as the Active Directory administrator. Currently, the opwdintg.exe utility requires English for the Windows OS. Ensure that the Windows OS language setting is English. Run the opwdintg.exe utility on each Windows domain controller. Open the Windows Explorer and then double click the opwdintg.exe utility. Do you want to extend AD schema? [Yes/No]: Enter Yes. Extending the Active Directory schema requires the Windows OS language setting to be English. Schema extension for this domain will be permanent. Continue? [Yes/No]:Enter Yes. You can only extend the Active Directory schema one time. If you try to extend the schema again, error messages appear, but you can ignore these errors. This step creates the following three verifier groups. If these groups already exist, then errors will appear, but you can ignore these errors. ORA_VFR_MD5 is required when the Oracle Database WebDAV client is used. ORA_VFR_11G enables the use of the Oracle Database 11G password verifier. ORA_VFR_12C enables the use of the Oracle Database 12C password verifier. Unless you have backed up the Active Directory schema, once extended, the Active Directory schema extension cannot be reverted. The next two prompts depend on whether the password filter has been installed already. Found password filter installed already. Do you want to deinstall? [Yes/No]: This prompt appears if the password filter has already been installed. In most cases, enter No to not deinstall the filter. If you enter Yes to deinstall the password filter, then you must re-run opwdintg.exe to re-install the password filter after you complete these prompts. Otherwise, after you restart the computer, the password verifiers will be no longer be generated when Active Directory users change their passwords. Do you want to install Oracle password filter? [Yes/No]: This prompt appears if the password filter has not been installed yet. Enter Yes. The change requires machine reboot. Do you want to reboot now? [Yes/No]: Enter Yes. You only need to install the Oracle Database software, not the full database. After you install the Oracle database software, you can configure centrally managed users with Active Directory during database creation by using Database Configuration Assistant (DBCA). You can also configure centrally managed users with Active Directory using DBCA or manually after database creation. Follow the instructions in the Oracle Database Installation Guide for your platform to install the Oracle software. After you install the Oracle database software, then you can configure centrally managed users with Active Directory during database creation using DBCA. You can also configure centrally managed users with Active Directory using DBCA or manually after the database creation. The ldap.ora file can also specify the connection to the Active Directory server. But because ldap.ora may already be used (or may be used in the future) for other services like net naming services, Oracle recommends the use of dsi.ora for centrally managed users. You use a dsi.ora file to specify Active Directory servers for centrally managed users. The dsi.ora configuration file sets the information to find the Active Directory servers for centrally managed users. You can use an ldap.ora file to specify Active Directory servers for centrally managed users. These steps assume that ldap.ora is not being used for net naming services and can be used to set up the connection with Active Directory for centrally managed users. You must manually create the dsi.ora file to identify the Active Directory servers. The dsi.ora file provides Active Directory connection information for all pluggable databases if it is located in the same places where the ldap.ora file can be placed. A dsi.ora file in a PDB-specific wallet location takes precedence over the main dsi.ora file for that PDB only. If you are using ldap.ora for naming services, then do not make any changes to ldap.ora for the CMU with Active Directory configuration. Only use dsi.ora to configure CMU-Active Directory. If the WALLET_LOCATION setting is included in the sqlnet.ora file, then Oracle Database searches for it in the location that is specified in sqlnet.ora. If the WALLET_LOCATION setting is not included in the sqlnet.ora file, then Oracle Database searches for it in the default wallet location. If Oracle Database cannot find dsi.ora in the wallet location, then Oracle Database searches for it in the following order. These are the same locations that Oracle Database searches for the ldap.ora file. Oracle recommends that you use directories for writable files under $ORACLE_BASE, not under $ORACLE_HOME. Starting with Oracle Database 18c, you can optionally set the $ORACLE_HOME directory to be read-only. Hence, you should place the dsi.ora file in a directory that is outside of $ORACLE_HOME to accommodate the dsi.ora configuration for future releases. Oracle also recommends that you use only dsi.ora to identify the Active Directory servers for centrally managed users. If both dsi.ora and ldap.ora are configured in the same database for centrally managed users for Active Directory and are both located in the same directory, then dsi.ora takes precedence over the ldap.ora file. If they are in different directories, then Oracle uses the first one that it finds in the location precedence list above to find the Active Directory server. If the directory server type in the first found dsi.ora or ldap.ora is not Active Directory, then centrally managed users will not be enabled. You can specify dsi.ora files for individual PDBs in a multitenant database. A PDB-specific dsi.ora will override the common settings in the shared dsi.ora or ldap.ora for that one PDB. Different PDBs can connect to different Active Directory servers for CMU. The dsi.ora files for PDBs are located in the same directory as the wallet for that PDB. If WALLET_LOCATION is not set in sqlnet.ora, then you can place dsi.ora in the default wallet directory for the CDB root container, located in the $ORACLE_BASE/admin/db_unique_name/wallet directory. However, this will only connect the CDB root container to the Active Directory, not the entire CDB database. If WALLET_LOCATION is set in sqlnet.ora, then you can place dsi.ora in that effective wallet location for the entire CDB database. This dsi.ora file will take precedence over those four default environment variable based locations. Log in to the host where the Oracle database is located. Go to the directory where you want to create the dsi.ora file. DSI_DIRECTORY_SERVER_TYPE, which determines the Active Directory server access. You must set it to AD for Active Directory. Enter this value in upper case. If you are already using an ldap.ora file for another purpose such as net naming services, then you must use the dsi.ora file to configure centrally managed users to connect with Active Directory for user authentication and authorization. Even if Active Directory is already being used for net naming services, then you must create and use a dsi.ora file to identify the Active Directory servers for centrally managed users. Even if the database currently is not using ldap.ora for another service, Oracle recommends using dsi.ora in case ldap.ora will be used at a future time for net naming services. The benefit of using ldap.ora is that you can use the DBCA graphical interface or the DBCA silent mode to complete configuring the connection to the Active Directory servers. When using dsi.ora, the steps to complete configuring the connection to Active Directory must be done separately. If ldap.ora is being used for naming services, then do not make any changes to ldap.ora. Only use dsi.ora to configure CMU-Active Directory. Typically, the ldap.ora file is stored in the $ORACLE_HOME/network/admin directory. Usually, the ldap.ora file cannot be in the same directory as the WALLET_LOCATION that is specified in the sqlnet.ora file, unless the WALLET_LOCATION is set to $ORACLE_HOME/network/admin. Go to the directory where you want to create the ldap.ora file. If the ldap.ora file does not exist, then create it by using a text editor. If the ldap.ora file does exist, create a backup of this file, and then open ldap.ora. DIRECTORY_SERVER_TYPE, which determines the LDAP server access. You must set it to AD for Active Directory. Enter this value in upper case. Request the Active Directory certificate from an Active Directory administrator. Copy the certificate text file (for example, AD_CA_Root_cert.txt) from the Active Directory server to a temporary directory (for example, /tmp) on the local host. If wallet location is not specified in the sqlnet.ora file, then the database will search the following locations in this order for the wallet. The directory location may need to be created. Oracle recommends that for each individual container in a multitenant database, you place the wallet files in the default wallet location under $ORACLE_BASE, that is, in the $ORACLE_BASE/admin/db_unique_name/pdb_guid/wallet/ directory. If you are using sqlnet.ora to specify the wallet location, then individual PDB dsi.ora and wallets will not be recognized. Only the database-wide dsi.ora or ldap.ora located in the shared wallet location or one of the four default locations will be recognized. The following command creates an auto-login wallet in the specified path. Create an entry in wallet with the user name of the Oracle service directory user account for performing searches in Active Directory (created in the first step). Create an entry in wallet with the DN of the Oracle service directory user account. In this example, the DN indicates that the DNS domain is production.examplecorp.com. The Windows domain name is just production. Create an entry in wallet with the user password credential of the Oracle service directory user account. Add the certificate to the wallet. Use the Active Directory certificate that you received from the Active Directory administrator. To configure the Microsoft Active Directory connection, you can set the parameters in the database or use DBCA. You can configure the Active Directory services connection manually by using LDAP-specific Oracle Database system parameters. Oracle Database Configuration Assistant (DBCA) completes the LDAP connection configuration and automatically creates the wallet and stores the Active Directory certificate for use. DBCA only works when ldap.ora is configured for CMU-Active Directory. Assuming ldap.ora (not dsi.ora) has been created in the correct location and configured properly, DBCA silent mode can create a new database or alter an existing database for the Microsoft Active Directory-Oracle Database integration. DBCA only recognizes the ldap.ora that is configured for centrally managed users, and only creates the wallet in the recommended default location. To use the default wallet locations, you must not set WALLET_LOCATION in sqlnet.ora. Oracle recommends using dsi.ora for CMU-Active Directory. Ensure that you have created the dsi.ora file or the ldap.ora file, and that you have created the wallet. Log in to the database instance as a user who has the ALTER SYSTEM system privilege. In a multitenant environment, you can log in to the CDB root or to a PDB. If you log in to the CDB root, then the parameters setting affects every PDB. If you log in to a PDB, then the parameters settings affect only that PDB. Modify the LDAP_DIRECTORY_ACCESS parameter, which determines the type of LDAP directory access. Valid values are PASSWORD and NONE (to disable the connection). PASSWORD requires an Active Directory server certificate and when you create the wallet, you must include the credentials for the Active Directory service user account for Oracle. You can also set this parameter in the spfile or in the init.ora file (if the init.ora file is used). Afterward, restart the database. Set the LDAP_DIRECTORY_SYSAUTH parameter to YES, so that administrative users from Active Directory can log in to Oracle Database with the SYSDBA, SYSOPER, SYSBACKUP, SYSDG, SYSKM, or SYSRAC administrative privilege. If you set this parameter to NO, then centrally managed users from Active Directory cannot log in to Oracle database with these privileges. These instructions assume that you have already installed the Oracle software and that you are using an ldap.ora file (not dsi.ora) to identify the Active Directory servers for the centrally managed users. If you have not installed the database software yet, then you can install the software using Oracle Universal Installer (OUI). After that, use DBCA to create the database, and at the same time you can configure the connection for Active Directory centrally managed users. Log in to the host where the Oracle database software is installed as a user who has administrative privileges. By default, the DBCA utility is located in the $ORACLE_HOME/bin directory. Select the Network Configuration option (or when you get to the Network Configuration option when creating the database). The Specify Network Configuration Details window appears. If the Directory Service Integration area is not visible, then the ldap.ora file was not configured correctly. Check the ldap.ora configuration that you did earlier, and after you have corrected the file, rerun DBCA. In the Service username field, enter the name of the Oracle service directory user account. In the Password field, enter the password of the Oracle service directory user account. In the Service user DN field, enter the DN for the Oracle service directory user account. The DN can be retrieved directly from the Active Directory server or from an Active Directory system administrator. Provide the path to the Active Directory certificate in the Certificate file location field. In a multitentant environment, DBCA recognizes and sets up Active Directory connections for the database instance connection. You must manually configure PDB connections if you want to connect a different Active Directory server to a PDB. In the Wallet password and Confirm password fields, enter and confirm the password for the Oracle wallet that will store the certificate and credential of the Oracle service directory user account. Afterward, DBCA automatically validates the service directory user account, creates the wallet, stores the user credential, and imports the certificate. Click Next until you reach the Finish page. Log in to the host that will have the Oracle database to be used for the integration. Make sure ldap.ora is created with the correct content in a correct location. Make sure that the WALLET_LOCATION parameter is not specified in the sqlnet.ora file. Run Database Configuration Assistant (DBCA) in silent mode. Log in to the host where a database is used in the integration. Go to the directory that contains the wallet. In a non-multitenant environment, the wallet directory is in the $ORACLE_BASE/admin/db_unique_name/wallet directory. For the CDB root, the wallet is in the $ORACLE_BASE/admin/db_unique_name/wallet/ directory. For a PDB, the wallet is in the $ORACLE_BASE/admin/db_unique_name/pdb_guid/wallet/ directory. Log in to the host where a database is used for the integration. Set the ORACLE_HOME, ORACLE_BASE, and ORACLE_SID environment variables. Log in to the database instance as a user who has the SYSDBA administrative privilege. Configuring password authentication for centrally managed users entails the use of a password filter with Active Directory to generate and store Oracle Database password verifiers on Active Directory. If you plan to use Kerberos authentication, then you must configure Kerberos in the Oracle database that will be integrated with Microsoft Active Directory. If you plan to use PKI certificates for the authentication of centrally managed users, then you must configure Secure Sockets Layer in the Oracle database that will be integrated with Microsoft Active Directory. To configure password authentication, you must deploy a password filter, extend the Active Directory schema by adding one user attribute, and create groups for generating different versions of password verifiers on Active Directory. You must perform password authentication configuration on Active Directory servers, and also on Oracle databases if it is required that Active Directory users will log in to Oracle databases with administrative privileges. For password authentication, centrally managed users have choices of how to log in to the database. For Active Directory users to log in Oracle database with administrative privileges, you must also set a password file with Oracle database. For password authentication, because Oracle Database does not pass Active Directory users' passwords through the ldapbind command to authenticate with Active Directory, you must install an Oracle filter and extend the Active Directory schema. The Oracle filter that you install in Active Directory creates Oracle-specific password verifiers when Active Directory users update their passwords. The Oracle filter does not generate all required Oracle password verifiers when it is first installed; the Oracle filter only generates the Oracle password verifier for a user when the user changes his or her Active Directory password. To maintain backward compatibility (if your site requires it), the Oracle filter can generate password verifiers to work with Oracle Database clients for releases 11g, 12c, and 18c. The Oracle password filter uses Active Directory groups named ORA_VFR_MD5 (for WebDAV), ORA_VFR_11G (for release 11g) and ORA_VFR_12C (for releases 12c and 18c) to determine which Oracle Database password verifiers to generate. These groups must be created in Active Directory for the Oracle password verifiers to be generated for group member users. These are separate groups that dictate which specific verifiers should be generated for the Active Directory users. For example, if ten directory users need to log in to a newly created Oracle Database release 18c database that only communicated with Oracle Database release 18c and 12c clients, then an Active Directory group ORA_VFR_12C will have ten Active Directory users as members. The Oracle filter will only generate 12C verifiers for these ten Active Directory users when they change passwords with Active Directory (18c verifiers are the same as 12c verifiers). If an Active Directory user no long needs to log in to Oracle databases, in order to clear the Oracle password verifiers generated for the Active Directory user, remove the user from any ORA_VFR groups, and reset the password (or require password change) for this user. You can also manually clear the orclCommonAttribute attribute for this user. Oracle password verifiers will no longer be generated after the user has been removed from ORA_VFR groups. Deploy the Oracle Database password filter and extend the Active Directory schema. The utility tool for performing this task, opwdintg.exe, is located in $ORACLE_HOME/bin. This utility installs the password filter in Active Directory, extends the Active Directory schema to hold the Oracle password verifiers, and creates the Active Directory password verifier groups. The password filter will enable the Microsoft Active Directory user accounts to be authenticated by the Oracle database when connected to clients using WebDAV, 11G, and 12C password verifiers. To deploy the opwdintg.exe executable, copy this file to the Active Directory server and then have the Active Directory administrator run the opwdintg.exe utility tool. Log in to Microsoft Active Directory as a user who has privileges to create and manage user groups. Check for the following password verifier user groups: ORA_VFR_MD5, ORA_VFR_11G, and ORA_VFR_12C. If these groups do not exist, then rerun the opwdintg.exe utility tool. If both the client and the server only permit authentication lower than Oracle Database release 12c (that is, they have Oracle Database releases 11g, or 12.1.0.1 clients), then add the user to the ORA_VFR_11G group. If a user must authenticate through an Oracle Database WebDAV client, then the user must be a member of the ORA_VFR_MD5 group. This configuration enables fine-grained control over the generation of the Oracle Database password verifiers. Only the required verifiers for the required users are generated. For example, if Microsoft Active Directory user pfitch is added to the ORA_VFR_12C and ORA_VFR_11G groups, then both the 12C and 11G verifiers will be generated for pfitch. This ensures that when applicable, the most secure and strongest verifier is chosen, while in other cases, the 11G verifier is chosen for the Oracle Database release 11g clients. Update the database password file to version 12.2. If it is required that Active Directory users will log in to Oracle databases with administrative privileges, then update the database password file to version 12.2. As a user with administrative privileges, log in to the host where the database that is to be used for the Microsoft Active Directory connection resides. Go to the $ORACLE_HOME/dbs directory. Run the ORAPWD utility to set the format to 12.2. This setting ensures that you can grant the various administrative privileges such as SYSOPOER and SYSBACKUP to the global user. Log in to the database instance as a user who has the ALTER SYSTEM privilege. Make sure that the LDAP_DIRECTORY_SYSAUTH parameter is set to YES in the spfile or the init.ora file. Set the REMOTE_LOGIN_PASSWORDFILE parameter to EXCLUSIVE in the spfile or the init.ora file. Alternatively, the user can use their Active Directory Windows user logon name with the DNS domain name. CMU-Active Directory only supports the Microsoft Active Directory Kerberos server. Other non-Active Directory Kerberos servers are not supported with CMU-Active Directory. You do not create database users identified externally as an Active Directory user's Kerberos UPN. Instead, you use global users that are mapped to Active Directory users or groups. You use an Active Directory user certificate when you configure Secure Sockets Layer Authentication. However, you do not create database users identified externally as the DN of the Active Directory user certificate. Instead, you use global users that are mapped to Active Directory users or groups. Users can be added, modified, or dropped from an organization by using Active Directory without your having to add, modify, or drop the user from every database in your organization. You can manage user authorization for a database within Active Directory. Most users of the database will be mapped to a shared global database user (schema) through membership in a directory group. Database global roles mapped to directory groups give member users additional privileges and roles above what they have been granted through their login schemas. You can map a Microsoft Active Directory user exclusively to an Oracle Database global user. You can update an Active Directory user to a Database global user mapping by using the ALTER USER statement. Administrative users can work as they have in the past, but with CMUs, they can be controlled with centralized authentication and authorization if they are using shared schemas. After you configure and authorize a centrally managed user, you can verify the user logon information by executing a set of SQL queries on the Oracle database side. Most Oracle Database users will be mapped to a shared database schema (user). This minimizes the work that must be done in each Oracle database when directory users are hired, change jobs within the company, or leave the company. A directory user will be assigned to an Active Directory group that is mapped to an Oracle database global user (schema). When the user logs into the database, the database will query Active Directory to find the groups the user is a member of. If your deployment is using shared schemas, then one of the groups will map to a shared database schema and the user will be assigned to that database schema. The user will have the roles and privileges that granted to the database schema. Because multiple users will be assigned to the same shared database schema, only the minimal set of roles and privileges should be granted to the shared schema. In some cases, no privileges and roles should be granted to the shared schema. Users will be assigned the appropriate set of roles and schemas through database global roles. Global roles are mapped to Active Directory groups. This way, different users can have different roles and privileges even if they are mapped to the same database shared schema. A newly hired user will be assigned to an Active Directory group mapped to a shared schema and then to one or more additional groups mapped to global roles to gain the additional roles and privileges required to complete their tasks. The combination of shared schemas and global roles allows for centralized authorization management with minimal changes to the database operationally. The database must be initially provisioned with the set of shared schemas and global roles mapped to the appropriate Active Directory groups, but then user authorization management can happen within Active Directory. An Active Directory user can also be exclusively mapped to a database global user. This requires a new user in the database that is mapped directly to the Active Directory user. New users and departing users will require updates to each database they are members of. Active Directory users requiring administrative privileges such as SYSOPER and SYSBACKUP cannot be granted these through global roles. Administrative privileges can only be granted to a schema and not a role. But even in these cases with administrative privileges, shared schemas can be used to provide ease of user authorization management. Using a shared schema with the SYSOPER privilege will allow new users to be easily added to the Active Directory group mapped to the schema with SYSOPER without having to create a new user schema in the database. Even if only one user is assigned to the shared schema, it can still be managed centrally. When using global roles to grant privileges and roles to the user, remember that the maximum number of enabled roles in a session is 150. Map shared global users, in which directory users are assigned to a shared database schema (user) through the mapping of a directory group to the shared schema. The directory users that are members of the group can connect to the database through this shared schema. Use of shared schemas allows for centralized management of user authorization in Active Directory. Exclusive global user mappings, in which a dedicated database user is exclusively mapped to a directory user. Not as common as the shared database schema, this user is created for direct database access by using either SQL*Plus or the schema user for two-tier or three-tier applications. Oracle recommends that you grant database privileges to these users through global roles, which facilitates authorization management. However, these users can also have direct privilege grants in the Oracle database, although this is not recommended. This is because two-tier and three-tier applications can use the global user as the database schema, so the global user has the full database privileges on the schema objects as the owner. It is common for a directory user to be a member of multiple groups. However, only one of these groups should be mapped to a shared schema. The Active Directory group must be created before the database global user can be mapped to it. You can add Active Directory users to the group at any time before the user needs to log in to the database. On the database side, you must have the CREATE USER and ALTER USER privileges to perform these mappings. This configuration can be used for users who have the password authentication, Kerberos authentication, and public key infrastructure (PKI) authentication methods. You can assign users who share the same database schema for an application into an Active Directory group. A shared Oracle Database global user (that is, a shared schema) is mapped to an Active Directory group. This way, any Active Directory user of this group can log in to the database through that shared global user account. Although the database global user account is shared by group members, the Active Directory user's authenticated identity (Windows domain and his or her samAccountName), and enterprise identity (DN) are tracked and audited inside the database. Log in to the database instance as a user who has been granted the CREATE USER or ALTER USER system privilege. Execute the CREATE USER or ALTER USER statement with the IDENTIFIED GLOBALLY AS clause specifying the DN of an Active Directory group. All members of the widget_sales_group will be assigned to the widget_sales shared schema when they log in to the database. Log in to the database instance as a user who has been granted the CREATE ROLE or ALTER ROLE system privilege. Execute the CREATE ROLE or ALTER ROLE statement with the IDENTIFIED GLOBALLY AS clause specifying the DN of an Active Directory group. All members of the widget_sales_group will be authorized with the database role widget_sales_role when they log in to the database. You perform the configuration on the Oracle Database side only, not the Active Directory side. You must have the CREATE USER and ALTER USER privileges to perform these mappings. This configuration can be used for users who have the password authentication, Kerberos authentication, and public key infrastructure (PKI) authentication methods. Execute the CREATE USER or ALTER USER statement with the IDENTIFIED GLOBALLY AS clause specifying the DN of an Active Directory user. You can update users whose accounts were created using any of the CREATE USER statement clauses: IDENTIFIED BY password, IDENTIFIED EXTERNALLY, or IDENTIFIED GLOBALLY. This is useful when migrating users to using CMU. For example, a database user that is externally authenticated to Kerberos will be identified by their user principal name (UPN). To migrate the user to use CMU with Kerberos authentication, you would need to run the ALTER USER statement to declare a global user and identify the user with their Active Directory distinguished name (DN). Log in to the database instance as a user who has been granted the ALTER USER system privilege. Execute the ALTER USER statement with the IDENTIFIED GLOBALLY AS clause. Using shared accounts simplifies the management of database administrators for multiple databases as they join, move, and leave the organization. Database administrators can also be mapped to exclusive schemas in databases. You can assign new database administrators to shared accounts in multiple databases using Active Directory groups without having to create new Oracle database accounts. Ensure that the password file for the current database instance is in the 12.2 format. In Active Directory, create an Active Directory group (for example, for a database administrator backup users group called ad_dba_backup_users). In Oracle Database, create a global user (shared schema) (for example, db_dba_backup_global_user) and map this user to the Active Directory ad_dba_backup_users group. Grant the SYSBACKUP administrative privilege to the global user db_dba_backup_global_user. At this stage, any Active Directory user who is added to the ad_dba_backup_users Active Directory group will be assigned to the new database shared schema with the SYSBACKUP administrative privilege. Log in to the database instance as a user who can create users and grant administrative privileges to other users. Create a database global user. Grant this user the administrative privilege. Due to the amount of work to maintain accounts and the mapping in both the database and Active Directory, a more centralized approach would be to use shared schemas for these administrative accounts as well, even if only one Active Directory user is assigned to the shared database account in some cases. Log in to the database as a centrally managed user from Active Directory that you have just configured and authorized. Verify the mapped global user. The mapped global user is the database user account that has the centrally managed user authorization. User PETER_FITCH is considered a global user with exclusive mapping for the Active Directory user pfitch, while user WIDGET_SALES is considered a global user with shared mapping for Active Directory group widget_sales_group of which pfitch is a member. A global user account has its own schema. Find the roles that have been granted to the centrally managed user. Execute the following queries to check the SYS_CONTEXT namespace values for the current schema being used in this database session, current user name, session user name, authentication method, authenticated identity, enterprise identity, identification type, and LDAP server type. Verify the current schema that is being used in this database session. A database schema is an object container that identifies the objects it contains. The current schema is the default container for objects name resolution in this database session. Verify the current user. In this case, the current user is the same as the current schema. Verify the authenticated identity for the enterprise user. The Active Directory authenticated user identity is captured and audited when this user logs on to the database. Verify the centrally managed user's enterprise identity. Verify the LDAP server type. Output similar to the following appears. In this case, the LDAP server type is Active Directory. Active Directory account policy settings cover the password policy, account lockout policy, and Kerberos policy. Oracle Database enforces all of the account policies for centrally managed users from Active Directory. For example, Oracle prevents Active Directory users with account status, such as password expired, password must change, account locked out, or account disabled from logging in to the database. If you are using Kerberos authentication, then Oracle prevents Active Directory users with expired Kerberos tickets from logging in the database. If you are using password authentication, then an Active Directory user account will be locked out for a specified period of time on Active Directory after the user makes a specified number of failed attempts consecutively when trying to log in to the Oracle database using incorrect passwords. With enforcing the account lockout policy, Oracle effectively prevents password guessing attacks against Active Directory user accounts.